April is the annual Month of Service for Buckeyes across the country! 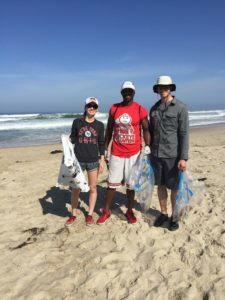 Join OSUSD in making a difference by cleaning up Mission Beach, home to Draft, one of our game day locations. After the beach clean-up, the Club will be providing a free lunch to all participants on the beach. This community service event is great for people of all ages, including children and was distinguished as Program of the Year in 2017 by The Ohio State University Alumni Association in Columbus for clubs across the nation. Please register on VolunteerMatch to participate in this community service event! All registrants will receive a free Buckeye Volunteer t-shirt, as well as a beer ticket that may be redeemed at Draft. More details for participating may be found on the VolunteerMatch website. If you have any questions, please email Jen at jennifer@osusandiego.com.